An amazing art exhibit at Pasadena City College by Peter Fend. In a visionary display, NYC artist Peter Fend has made a bold challenge to both the Bush Administration and oilopoly by redrawing the world maps not by nation states but by trans-boarder Salt-water basin regions. His maps insist upon a global vision that put survival before nationstate and insist by their very vision on a sustainable-non fossil-fuel based global culture. 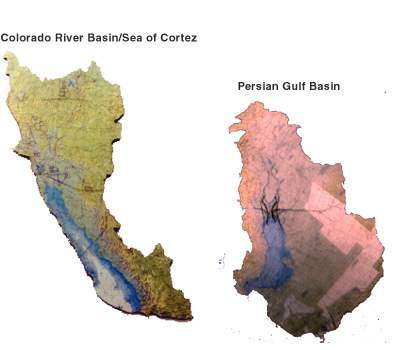 For the show "flow-lines" he presents two maps, a map of the colorado river/sea of cortez basin and the persian gulf basin. "The ... builds on a practice at the US department of State now, of matching up river basins for comparative development. Under the Sate Department, scientists and engineers are encouraged to match up and compare proects for the Yangtze basin on the one hand and the Missippi/Misouri basin on the other." Peter Fend argues that for a healthy planet, we must start thinking in terms of water basins, not countries. we must understand that a regions most natural allie is a region that it can learn most from- that is- a region with similiar ecosystems and environmental indicators. In comparing and demanding parity between Southern California and its natural ally- the persian gulf- he calls on intense criticism of US government policy. He applauds the water and environmental management that the USSR and Iraq had historically done until their riparian repairs were blown up as a result of American Intervention in the region. Yet, ever the artist- Peter claims that the riparian repair systems were based on a model provided by early american conceptual artists. Critique the Bush administration further still. Peter Fend states that yes, Iraq has weapons of mass destruction. Those weapons are buried under ground in Iraq- it is known as oil. He states that If that oil were to be burned off in accordance with Bush/big oil plans- it would do greater harm to the planet than any weapons of mass destruction that Iraq may have. Peter Fends well thought out bio-centric plans are astounding. He has for the last 20-odd years tried to get his plans instituted on policy level. Yet, despite meetings with the UN, Hugo Chavez, and other political officials, the world seems yet unable to switch from a petroleum based world of Nation States to a sustainable world of River Basins. The first image is that of a map with redrawn territories. 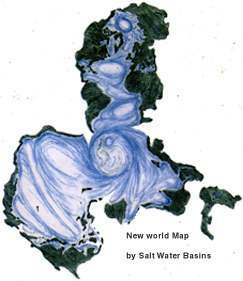 Each land mass is a seperate water basin. You will note that the map centers around Antarctica- the life pump of the earth's waterways and ecosystems.